Are you exhausted from trying to rock or jiggle your baby to sleep? Only to have them wake the minute you lay them down. Parents are told that you can't spoil a newborn. This depends on your definition of the word spoil. I believe parents are constantly training their babies whether they realize it or not. It is possible to teach your newborn baby to fall asleep easily on their own with very little help from Mom and Dad. As a certified infant specialist I am called on to help exhausted parents solve their baby's sleep issues. Many times these babies are 3 months of age or older. Most infant sleep issues could be easily avoided if parents understood the three necessary steps a baby passes through on their way to a sound sleep. The most important thing you can do to help your baby learn healthy sleep habits is to lay them down while sleepy but awake. Rocking and holding your baby to sleep is something that even a newborn will quickly get used to. You are teaching them that they need this to be able to fall asleep. It is much better to reserve holding and rocking for when your baby is awake and alert. There are three very definite stages that a baby passes through on the way to sleep. Understanding and recognizing these stages is critical in the success of sleep training your child. 1. The Wiggle Waggle Squirm Stage: This is the point where your baby is still awake and possibly fussy. They may grunt, squirm and fight the swaddle. 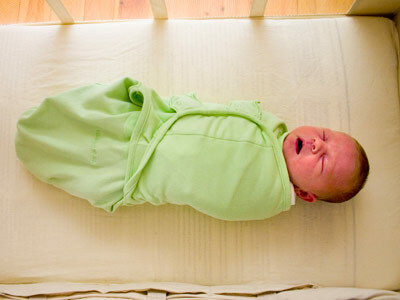 Many parents tell me their baby hates the swaddle because they seem to fight it. This is actually a normal part of the learned process of falling asleep. This stage will last longer if you choose not to swaddle, as baby will startle and flail. The result will be a baby who takes longer to pass through the first stage of this process. Allow your baby at least 10 to 15 minutes to settle and move on to step two. Make sure that you have white noise playing loudly nearby. The white noise allows the babies nervous system to calm down and relax. If your baby is crying the white noise should be as loud as baby's cries. 2. The Five-Mile Stare: Once baby has passed through the fussy stage, they will get very still and stare into the distance. I call this the five-mile stare. Baby may lay quietly, looking into space for up to 15 minutes. If a noise startles baby when they are in this stage, they will most likely move back to stage one and squirm and fuss for a bit. It is very important that you do not pick baby up at this point. As long as they are not crying loudly for more than five minutes allow them to cycle back through to the five-mile stare. You can jiggle the baby in their swaddle and loudly shush in their ear, but try not to pick them up. This is a crucial step in baby learning to self soothe. 3. Sweet Sleep: Babies eyelids will begin to slowly close. They may yawn or slowly open and close their eyes several times. This is a sure sign that your baby is well on the way to sleeping peacefully. Most parents do not realize that falling asleep on their own is a learned behavior. It is a very important and necessary skill that can be taught from the earliest days home from the hospital. Laying baby down while sleepy but awake and allowing them to fall asleep naturally is the most important first step. Understanding the normal stages that a baby passes through on their way to a deep sleep will help you be successful in sleep training your new baby.